A kind of existential week; not entirely successful and culminating with the suspect use of “existential” - a dodgy definition formed as a teenager when required by my English teacher to read Sartre. He was always good for a laugh - the teacher that is - some vague notion that it wasn’t so much what you were doing - or even why - more that you were doing something. Thirty years later and with the knowledge that English wasn’t my strongest subject, it allows for last week; something was getting done, but it’s best not to concentrate on direction. 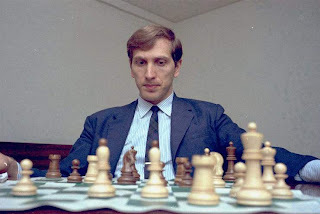 Genius and Madman was the sub-heading to a Bobby Fischer biography on the BBC. I confess I did feel sorry for Fischer; in particular at a press conference where, having been granted Icelandic citizenship, he was silent for a moment as if aware of what he’d become. I’m not sure what heading I could apply to the woman on the tram whose racist ranting was captured and duly posted to YouTube. On reflection, I wondered if genius was all that separated the two. Fischer came across as an unpleasant individual even before the descent that followed his victory in 1972. Was his anti-Semitism a symptom of his madness, or his madness a vent for his anti-Semitism? The documentary suggested the former, further reading suggests the latter.